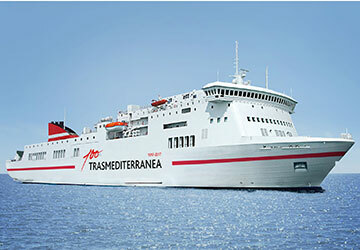 The Albayzin was built in 2004 and is now part of the Trasmediterranea fleet. The vessel carries around 1000 passengers and also caters for 172 vehicles during its crossings. This spacious ship has plenty to offer to keep travellers occupied while on board. Facilities include an a la carte and self-service restaurant, a disco bar, comfortable cabins, children’s playing area and child care options, spacious pet areas as well as the usual shopping services. 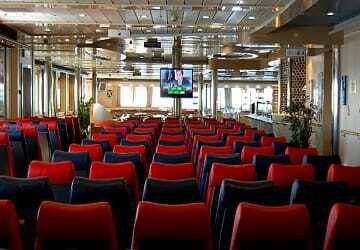 Cabins are available for customers who want that little bit of extra comfort during their Mediterranean voyage. 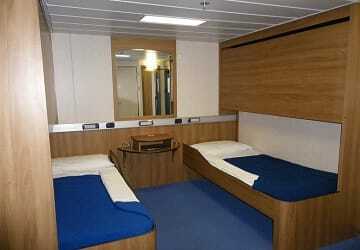 The rooms come with bathroom facilities and are also suitable for those onboard with restricted mobility. A variety of different eateries and drinks options are available on the Albayzin. 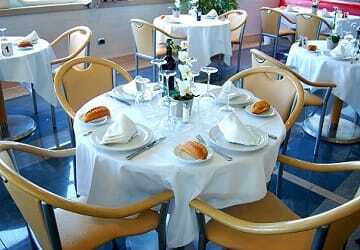 With a self-service restaurant and an a la carte option there is plenty of choice for travellers. 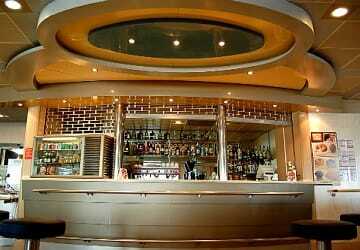 For those that want a more lively scene, there is the Disco Bar with a large variety of drinks. Fancy a bit of retail therapy? You can indulge in some duty free shopping whilst travelling with Trasmediterranea. You will have the opportunity to take advantage of cheaper than high street prices and also purchase magazines, books and puzzles to pass the time during your crossing. A deck area with sun loungers is offered for customers to enjoy the beautiful views and weather the Mediterranean has to offer. One useful little extra are the booths and walking area provided for those travelling with pets. 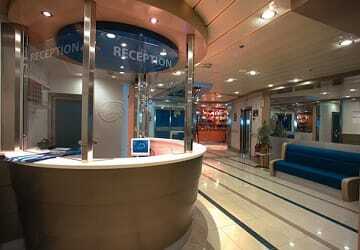 Pets have spacious, private areas to stay whilst you enjoy what services the ship has available. If you are travelling with babies, toddlers or children there are plenty of amenities at your disposal. 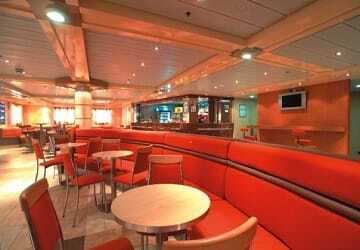 A kids play area is onboard and also childcare options if you want a little break whilst onboard. Changing facilities are also available. Access for people with restricted mobility is of a high standard on the Albayzin with the cabins, toilets and ramps adapted. Please Note: Whilst we have taken great care in making our Albayzin guide as accurate as possible, onboard facilities, services and entertainment may vary depending on the date and time of year that you travel, facilities mentioned may change without notification and ferry companies reserve the right to operate vessels other than those mentioned at time of booking without prior notification. MY TRIP WAS GREAT EVEN THOUGH I DIDN'T REALISE THE BOAT CALLED IN AT EVERY CANARY ISLAND ON ROUTE. BOAT WAS FINE FOOD OK REALLY AND WAS WITH MY FARE INCLUDED. STAFF ON BOARD VERY GOOD. TAKE A GOOD BOOK OR A SUDUKO AS THERE NOT A GREAT DEAL TO DO ON BOARD. This is a great way to get to La Palma. Three days at sea, spending my days chilling out on the sunny deck with a coffee, was awesome. Unfortunately the cabins are without air conditioning and got problems with the toilets, a part all was good. Clean ship, silent, excellent staff, wxcellent journey. I travelled from Cadiz to Tenerife on the 25th of November 2014 The crossing was great, the ferry was basic but very comfortable and the staff were extremely friendly. The cabin was good nice and clean and warm. The food was excellent I have had worse in a 4 star hotel. Thank you very much I will use you again and I will also recommend you to others. No water in the pool, the roof over the pool wasn't open so we couldn't enjoy the sun. The food that was included in the price was bland. Nothing to do on the ferry, would've been nice with a trobadour for example. The trip was a transport distance more than anything else. Very good service, friendly personal, good and plenty food, perfect accomodation as I had a cabin for myself. Departure and arrival all within the times as previewed. Has everything worked out great. Set off on time and arrived on time. Over and over again. "Never again Trasmediteranea with dog "
The accommodation on the ship Albayzin for the dogs (called the dog pound) is located on parking level 4 access is via a fairly steep iron stairs, no elevator. The boxes (cages) are indeed spacious, but are in addition to the transport trucks, which require power and next to the trash cans It's noisy and stinks There regulated visiting hours about 5 times a day you can under no circumstances stay the whole day with his dog and now the most important:..... with heavy seas is not a visit to the dogs possible! which means in my case 30 hours without walking the dog! And without the dog to see. impossible states. There are surveillance cameras everywhere and the doors are locked! A creep into the cabin is not possible. The supervision of the dogs is similar to that of felons. And times should not be led astray, even small dogs up to 6kg in own transport boxes may not in the cabin nor to any other public space. these dogs need at night in the cages. If you want to leave the dog in the car (RV), you have to sign anything that you do it at your own risk. Is only recommended on Deck 5, Deck 4, and since the others can be in heavy seas enter under any circumstances. And lastly, it is not recommended to leave his car put next to the overloaded, stappled vans of Moroccans, poses a huge security risk in heavy seas. On my crossing, some of these cars have come into spin and even upset, one with the load against my camper. we had a very nice journey, we tried a selection of the food on offer and all was fine. "Crossing Santa Cruz de Tenerife to Santa Cruz de la Palma "
Prima Property (unit), very good service. Since I've been drinking early in the morning just a coffee, I can say nothing about the food. The coffee was very good. My only complaint is that the Seats are not comfortable enough to sleep. Otherwise, the crossing was OK.
"First time venture from Valencia to Mahon"
The ferry service was both prompt and efficient in terms of time and of personnel. Although there were few instructions at the terminal in Valencia or on the website to help inexperienced ferry travellers, this was my first experience of a Mediterranean ferry, staff were available to help in security and also at the bar. It was really good to have a bar service available even though we arrived at the terminal some six hours ahead of time! The weather on the day did not encourage us to venture further into Valencia on the day. Loading was very efficient and ahead of leaving by a good margin. The top deck for the Mahon cars was a bit hairy to reach but well staffed. The food service was adequate and the set menu okay but not inspiring . The bar staff were very friendly and helpful. Cabins were fine. Comfortable and available throughout the journey which was appreciated. We slept very well on the first leg and only awoke to the announcements in Palma. The next leg was a little choppy so the cabin was good to relax in. We had a bit of a free for all disembarking at Mahon and I think more guidance could be given to a distinct order for the rows of cars reversing to leave the top deck. Once off we left very quickly and the local police were very much in attendance and helpfu Would not hesitate however in using the ferry service again.